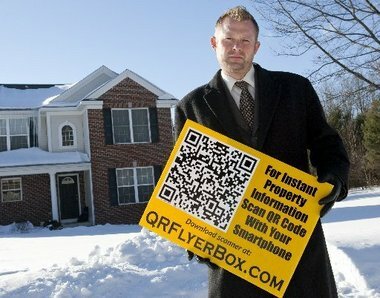 If you have any connection to real estate marketing, you probably can’t miss the new hype surrounding QR codes. Their appearance is growing on real estate printed material, on real estate signs and even on realtor’s websites. Many of these codes will direct you to mobile sites and some of these sites are really helpful and effective. Not all QR codes are presented correctly and there are many examples of wrong and good execution of the codes. 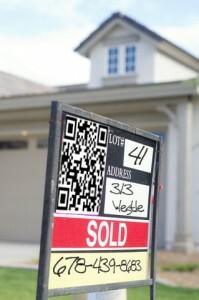 QR codes are an excellent tool for real estate – use them! They will filter out customers that search for something else, freeing your time for the more serious customers. They will bring you new customers that you may have never reached otherwise. They will even save you time since some things may be done now remotely thanks to QR codes. Here are some guidelines that will help you to use QR code correctly and effectively for real estate marketing. A question that often rises is, should I have one QR code for my assets or should I use a set of different QR codes? My answer here is clear – use many, as many QR codes as needed. Do not be afraid to create many different QR codes because their specific context is important. QR codes signs are also are recyclable, so creating them is just a onetime effort. Create location sensitive QR code. A location sensitive QR code is a QR code that can tell you where it is located. The simplest way to do this is not by asking the customer to turn on the GPS for getting his/her location in the moment of scanning, since not all users will allow this. The best way to do this is to add a parameter to the URL decoded in your QR code. Simply encode http://www.my-agency-mobile-site.com?12378 to signify your system that QR code number 12378 was clicked. Once decoded you know at your site where exactly the QR code was clicked. Now decide what the relevant action is and provide the relevant information. We will see examples for this shortly. QR code size is very important for outdoors sings and I am going to explain why. The bigger your QR code is the greater its decodable radius is. Think of it, by multiplying your QR code size by 2 you are increasing your target audience by 4. Increase the QR size by 1.4 wills double the number of customers that reaches you from these QR codes. Since we do not have here a focusing problem – all camera devices focus quite well for distances greater than 2 inch – there is a simple rule connecting the QR code size to its scanning distance. Every QR code module height should be at least 0.23 inch (6 mm) so that a person will be able to read it from a distance of 3.25 feet (1 meter). A QR code module is one black or white dot in it. This ratio is the same for greater distances (0.46 inch for 6.5 feet – etc). Version one QR codes have 21 modules. Add to these 2 additional modules in each side for quite zone and you have 25 modules. If you want people reading your code from a distance of 6.5 feet your QR code should be 11.5 inches tall (9.6 inch without the quiet zone), 23 inches will reach people at distance of 13 feet. Version 2 QR codes requires 25+4 modules for quite zone, they should be 26.8 inches tall to reach people at distance of 13 feet. So it is important to have a low QR code version as possible. Here are few guide lines for choosing your right QR code. 1 – Do not use low error correction level for outdoors signs. Use a Medium error correction level for your QR code as a starting point. See here a list of QR code generators that create Medium EC level QR codes. 2 – Add a parameter to your URL address to identify the specific QR code that was scanned. 3 – Try capital letters for regular websites, they will create better QR codes (with smaller versions and bigger modules) for you. 4 – If your URL is too long try a shortened URL (do not change it to capital letters here). 5 – Try going up in EC level for your QR code, if version does not grow choose the higher EC level QR code. It will provide you a better readability from far distance as long as your QR code version does not grow when you go up in EC. Here are two other QR codes with lower versions and same URL. The A QR code has a Medium EC (15%) version 4, while the B QR code has a Quality EC (25%) version 4 too. 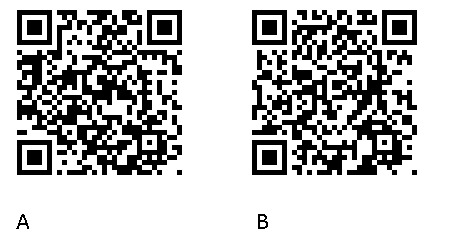 The original QR code has a higher EC (30%) but is of a higher version too – version 5. In that case always prefer the B code over the A code, since it will be more readable under dirt glare and other hazards that might happen, and it does not take more size. The QR code is reachable from a distance greater by one tenth from the distance enabled by the original QR code, its area coverage is 20% more than the original one. You have of course to choose whether the additional 5% in EC is more important than extending the reading distance. Since the QR code is not decorated and its data is not harmed at starting point I will go for the Quality 25% with greater distance. By the way the mobile site behind the code is well executed and can be served as an example on how to make a good mobile site for real estate. I am sure there are other good mobile sites there as well. 2. Property flyers. Provide a QR code with a URL pointing to your updated offers. If you advertise specific houses put a QR code that leads to special content related to this house. It can be a video showing the interior and environment of the house, it can be a detailed description with photos and the best is a mobile website with a range of options including your contact details and a way to book them into the phone. 3. Billboards & Other Outdoor Environment. Here the size of the QR code is important as mentioned above. Try to put it in an average human being height– not too low or too high. Decorate it and make clear – where it will lead you. Provide location/context relevant information, for example if the QR code is on a bus station, provide your customer with a map showing houses connected to the bus route. Provide a map that shows the properties for sale around the spot the QR code is located in. 4. Real estate signs. These are usually located near houses for rent or sale. Create a special QR code for this property (if it has a sign it deserves a QR code as well). Provide relevant information for the property, people do not scan such codes to get general info on your agency. Show a video; take your customer to a virtual tour in the house. Photos of the property inside and additional details like open house hours will also interest your customer. Provide also a link to other properties similar to this one and other properties in this neighborhood. 6. Websites. Do not put QR codes in your website that leads to other pages in your site, or to your mobile site, regular links are made just for this and desktop sites still looks better on computer screens. If you want to put a QR code on your website, put a QR code with your contact details so that your customer can easily book you in his mobile phone. 1. First and very important point – target all your URL QR codes to mobile sites. Regular websites looks awful on phone screens, by missing this point you will create a bad image in the customer’s eye and you will lose the opportunity to provide your potential customer with relevant information and making him/her to contact you. 2. Video – although it is not wise to provide a video for outdoors scenes, the situation of a customer standing in front of a house he considers to buy is an exception. Not all phones support the same video format, if you provide a video you must be aware of the type of phone you are going to send the video to. Note – every time a phone reaches your website its identity is contained in the http-header, you can search for iPhone, Android, Nokia or any other device type, and direct the correct video format as answer to the http request. This is not a difficult thing to do and it is much better than presenting the user with buttons to choose his phone type for getting the correct video – as some mobile sites do. 3. Provide some text or graphics telling the user where the QR code will take him, add a suggestion where to download a reader – not all devices have one. 4. Quiet zone – assure that there is a quite zone around the QR code on the sign. Here is a bad example I found in Google images. Don’t do that; leave a space of at least two modules width around the QR code. Although good readers will be able to read this – do not count that your potential customer is using one. Although the QR code worked well and the property was sold – it still suffers from a missing quiet zone. Not all readers will survive this. It contains no hint to where the QR code will take you and has no suggestions on where to find a reader. 5. Take scanning distance into consideration. Design your QR codes so that their size and location will enable reasonable scanning distance. 6. Find a service that will track your QR codes. This is especially helpful if you have QR codes that you can identify by parameters as described above. If you one of your QR codes is located in a place that provides a great number of clicks, put behind its link in the mobile site a varying or attractive content. 7. Add a link to Facebook or Twitter in your mobile site, so that people can consult their friends. Social media proves to have a major impact on buying decision of people today. Your Facebook page is also an option. 8. Last but definitely not least – test your printed code in real final size. Use at least two readers – just to make sure there are no surprises. Finally, use the flexibility that identified QR codes provides you. When the property is sold you can remotely change the URL page content to a ‘sold property’ page without reaching the physical sign. You can suggest in this page to your disappointed customer other similar assets in this neighborhood. The same sign with same QR code can be later positioned near another property. This entry was posted in create QR codes, error correction, QR code business card, QR code generators, QR code real estate, QR code scanning distance, QR code size, Qr code usage, QR codes potential and tagged create QR codes, error level QR codes, QR code generators, QR code real estate, QR code scanning distance, QR code usage, QR codes business cards, Size of QR code. Bookmark the permalink. Thanks for the great explanation. I have been trying to figure out the right size of QR code to put on a real estate sign. I was thinking around 12″ square would be good. This article is very informative and has a lot of useful tips. Thanks Susan. I wrote it just for this purpose, it is good to know that indeed it is helpful. If there are still open issues or questions you have please feel free to ask, I will be happy to help. REALTORS… Did you know that RealtyView Television is a mobile app that allows the user to scan a QR Coded house sign and instantly watch a video tour of the property on their mobile devices? No more security worries or missed appointments. Never run out of flyers again. Go Mobile with RealtyView Mobile Television.